Iconic denim brand Levi Strauss & Co. (NYSE:LEVI) has returned to the New York Stock Exchange and demand for Levi’s initial public offering (IPO) is off the charts. After all, it’s not often you get to buy into a 166-year-old company. Started by Levi Strauss and his customer Jacob Davis in 1873, the denim maker is taking a second crack at being a public company. The first time was in 1971. It lasted 14 years before descendants of the founder took the company private for $1.6 billion in 1985, at the time, the largest buyout of a publicly held U.S. firm. Flash forward to 2019, and it’s ready for a second kick at the cat. I hadn’t thought about writing about Levi’s IPO, but then I got an email from Motif Investing offering IPO shares, and I just had to take a look at its prospectus. While I have total respect for the job CEO Chip Bergh has done turning the denim brand around, I’ve got my doubts about buying LEVI stock, which is bound to be popular. After looking at Levi’s prospectus, I concluded that its IPO is pricey from a valuation perspective. However, when I saw a MarketWatch article suggesting its stock is undervalued, I just had to understand the authors’ rationale. Fundamentally, the authors believe that Levi’s enterprise value as a multiple of invested capital at 2.7 times is low given its return on that invested capital over the past five years has never dropped below 14%. Furthermore, the authors conclude that Levi’s fair value based on its discounted future cash flow is worth $19 a share or a market cap of $7.3 billion [based on 385.5 million shares outstanding after the IPO]. I don’t see things nearly as rosy. While you might think it makes sense to compare Levi’s to other jean manufacturers and retailers, I’m going to compare it to Lululemon (NASDAQ:LULU), a brand that’s still very much in growth mode, and an alternative you ought to consider before pulling the trigger on LEVI stock. In fiscal 2018, Levi’s had adjusted EBITDA of $706.6 million. At the midpoint of its $14-$16 price range, Levi’s is valued at 8.2 times its adjusted EBITDA [$5.78B divided by $706.6M]. In fiscal 2018, Lululemon’s EBITDA was $564.2 million, which means its market cap of $19.3 billion is 34 times EBITDA. On the surface, it seems like a no-brainer in Levi’s favor. However, you have to remember that LULU has grown revenues by 66% over the past four years compared to 17% for Levi’s. Also, LULU’s operating margin is 17%, 740 basis points higher than Levi’s. As long as Lululemon continues to grow its men’s, Asian and online businesses, it will continue to outperform Levi’s. Do yourself a favor and compare Levi’s to companies like VF (NYSE:VFC) and American Eagle Outfitters (NYSE:AEO) and you’ll see that a valuation of $5.78 billion or more is quite high on a comparative basis. If you want to own shares of Levi’s be prepared for the Haas family to run the show because they control Levi’s through the Class B shares. I’m of two minds when it comes to dual-class share structures. On the one hand, having a majority of the votes in the hands of long-term investors is a good thing. However, on the downside, is the fact that many of the large institutions that will be buying Levi’s shares will have almost zero say in how the company is run. Oh, sure, in good times, who cares about corporate governance, but when Levi’s falters, and it will because all companies go through difficult times, CEO Charles Bergh will have to convince not only the board but the entire Haas family of his plan to right the ship. That’s never an easy task. Well, that’s not entirely true. In recent years, Levi’s has done an excellent job reducing its dependence on bottoms. In 2018, 74% of its revenue (both men and women) were from bottoms, 20% from tops, and 6% from footwear and accessories. Three years earlier, bottoms were 83% of its business, tops accounted for 11% of revenue and footwear and accessories the remaining 6%. 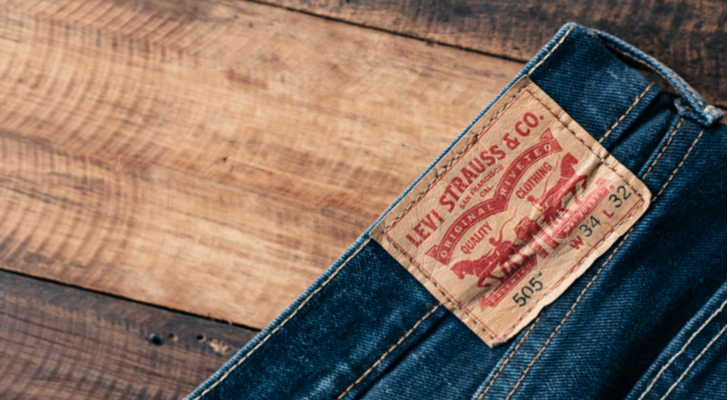 However, its Levi’s brand continues to be the dominant player, accounting for 86% of its overall figure, a number that’s barely budged over the past four years. What’s confusing about the prospectus is its interchangeable use of the words bottoms and pants. If I’m reading it correctly, pants, which accounted for 68% of overall revenue in 2018, are jeans and khakis, while the figure for bottoms includes pants as wells as skirts and shorts, which accounted for 6% of its overall revenue, flat to 2016. Also, its Dockers brand has slipped in importance, accounting for 7% of overall revenue in 2018, down from 10% in 2015. As denim goes, so goes Levi’s. It wasn’t too long ago that experts were calling for the demise of the blue jean. While I doubt that’s ever going to come to pass, you never know if a new trend will arrive to supplant both denim and athleisure wear in the future. Assuming Levi’s goes out at a valuation of $5.78 billion, the company’s long-term debt of $1.1 billion will be 19% of its market cap. That’s not a massive amount by any means considering it’s got more than $700 million on its balance sheet, but I can’t help wonder why it hasn’t paid down its debt over the past four years. Since fiscal 2014, Levi’s paid off just $158 million of its long-term debt, which consists of $486 million in 5% senior notes due in May 2025 and $535 million of 3.375% senior notes due in March 2027. The company expects to generate as much as $184 million in net proceeds from the sale of Class A shares other than those of the selling shareholders. None of which is earmarked for debt repayment. That seems odd considering the high level of debt and cash. In the InvestorPlace stock-picking contest for 2019, I picked Canada Goose (NYSE:GOOS) because I believe it’s developing a trifecta of growth — wholesale, direct-to-consumer and online — that will allow it to grow the top line by double-digits for the next few years without spending too much money on expensive store openings. By limiting the number of retail locations to 20-30 in some of the world’s best cities, it provides the brand with a good advertising vehicle, while keeping the costs down. Levi’s opened 74 stores in fiscal 2018 alone, including a 17,000 square-foot location in New York City’s Times Square. That brings the company’s retail footprint to 831 stores with another 500 shop-in-shops. When you consider that those retail stores along with its e-commerce sites accounted for just 35% its overall revenue in fiscal 2018 — with an embarrassingly low 4% from e-commerce — I have to wonder if it will ever find the right balance between the three revenue streams. In the last three years, Levi’s capital expenditures have increased by 55% from $103 million in 2016 to $159 million in 2018. If it keeps opening 17,000 square-foot flagships, it’s going to need a lot more than $159 million to get the job done. I’d watch spending if you do buy shares in the company. There’s no question that CEO Charles Bergh has done a good job turning around the brand. Last July, the Harvard Business Review published a good article about Bergh’s transformation. If you’re planning to invest, I recommend you read it. Of the four part’s of Bergh’s strategy, all of them are very much a work in progress. The one needing the most work is its goal to become a leading omnichannel retailer. In my books, you’re not a successful omnichannel retailer unless you’re generating at least 20% of your revenue online. In 2018 and 2017, Levi’s e-commerce revenue accounted for just 4% of its overall revenue, well short of what’s required for omnichannel excellence. For all Bergh’s accomplished, he’s still got a lot to prove in my opinion. Ultimately, has he done enough to justify three-year total compensation of $34.3 million, which doesn’t include the $138 million worth of stock he’ll own or have the right to acquire after Levi’s IPO? If you buy Levi’s shares, I guess you’re going to find out. Of all the negatives I’ve found about Levi’s, the lack of success in Asia is the biggest surprise. In fiscal 2018, its Asian business contributed just 16% of Levi’s overall revenue compared to 29% for Europe and 55% for the Americas. On a constant currency basis, its Asian business grew revenues by 8.2% in 2018, 180 basis points less than its growth in the Americas and less than half that of Europe. To catch up to Europe’s overall revenue of $1.6 billion, Asia’s got to double its sales to do so. True, you can look at it from the perspective that the best is yet to come, but given how competitive the Asian market is, I doubt that’s going to happen anytime soon. Worse still, Asia’s operating margin in 2018 was 9.8%, 830 and 800 basis points less than Europe and the Americas, respectively. Asia’s got to hustle if Levi’s hopes to get to $10 billion in sales by 2023. Article printed from InvestorPlace Media, https://investorplace.com/2019/03/levi-stock-dont-buy-the-ipo/.